Yes, you can add pizazz to your garden with Canna, Caladium and Colacasia. The strong focus on spring flowering bulbs in our gardens can overshadow the many wonderful choices of summer flowering bulbs that will perform quite well here in an increasingly hot New Jersey. Cannas bring tropical splendor and architectural interest to summer borders and they also flourish along the damp margins of a pond. These bold plants feature clustered, flaglike blooms in a brilliant array of colors. 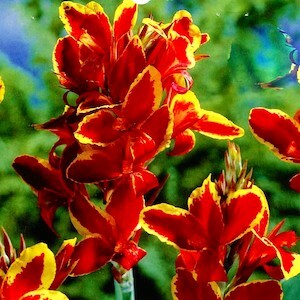 They are deer resistant, easy to grow and attract butterflies and hummingbirds. Providing color pizazz in dim places where flowers can’t, caladiums have come into their own recently with the craze for tropical plants. The clumping, heart-shape leaves are available in a variety of veined patterns in colors from cream to neon pinks, reds, silvers, and greens. Plant caladium tubers shallowly in pots, and water sparingly until sprouts appear. They begin to grow vigorously once the weather warms in late spring to early summer. Elephant’s ears are big, dramatic, tropical-looking plants grown for their bold foliage. Aptly named, many bear triangular leaves that are leathery and uniquely textured. These tropical plants enjoy the boggy soils around water gardens. The clumping foliage adds lush effects in the landscape and is especially effective in large containers. The plants sprout from large bulbous roots and achieve maximum growth in warm, humid summer temperatures.